San Francisco, CA (January 21 to 23, 2018): The Specialty Food Association (SFA) once again opened its 2018 Winter Fancy Food Show at the Moscone Convention Center on Sunday, January 21, 2018. Established in 1954, it is the largest marketplace devoted to specialty foods and beverages in North America. In 2018, the SFA has over 3500 member companies all over the world and this was exemplied in this year's Fancy Food Show. There were more than 1,400 exhibiting companies at this year's show. These companies presented the latest chocolate, cheeses, olive oil, bake goods, jams, salsas, coffee, tea and other beverages. From the US, California had the largest number of exhibitors followed by New York, New Jersey and Oregon. This year there were 14 pavillions with the largest ones from Italy then Japan, France, Spain and then Germany. From Southeast Asia, Japan had the largest pavillion with smaller ones from the Philippines, New Zealand and Vietnam. Finally, the highlight of the show was the 2018 SFA Leadership Awards. This honors the most influential and innovative entrepreneurs who are transforming the way specialty food industry does business. The evening's program was opened with the 2018 Keynote Speaker: Mr. Walter Robb. Mr. Robb joined the Whole Foods Market in 1991 and contributed to its significant growth for over 20 years. About 8 years ago, he was named co-CEO with Mr. John Mackey. Last year, he transitioned his role as Chairman of the Whole Kids Foundationa and Whole Cities Foundation. The 2018 Leadership Awards night was in its 6th year and the winners were recognized for tackling world hunger with alternative proteins, donating clean water and meals to underdeveloped countries, employing disabled adults, educating underserved communities about nutrition and developing elderberry as a viable crop. Winners this year were chosen in 3 categories: 1. BUSINESS LEADERSHIP: advancing practices in food industry accross workforce issues to benefit personnel; 2. CITIZENSHIP: advancement of environmental and social sustainability; 3. VISION: advancing new approaches and products to positive change and future progress. 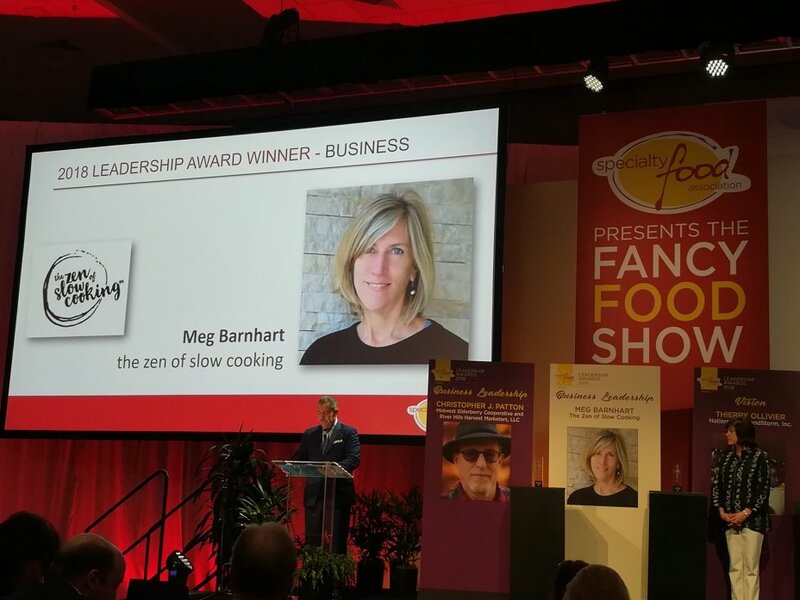 Mr. Phil Kafarakis, current President of the SFA, presented the 2018 Leadershop Awards to the following winners: 1. BUSINESS LEADERSHIP: Meg Barnhart:, the Zen of Slow Cooking and Christopher J. Patton, Midwest Elderberry Cooperative and River Hills Harvest Marketers, LLC; 2. CITIZENSHIP: Ryan Emmons, Waiakea Hawaiian Volcanic Water and Sam Mogannam, Bi-Rite Family of Businesses; and finally, 3. VISION: Mohammed Ashour, Aspire Food Group and Thierry Ollivier, Natierra By Brandstorm, Inc. (All Text and Photographs by Rene L. Zamora, Newsmexx TV, Henderson, Nevada, USA).